Four dollars for one gallon of gas. I think the last time I filled up, gas was a “only” $3.78 a gallon . Hmmmphh. 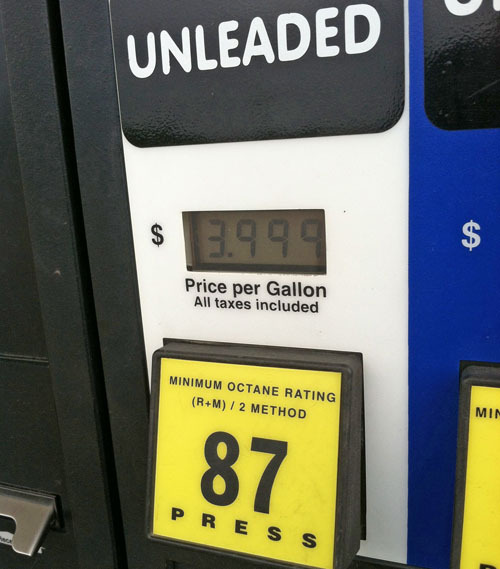 We’ve written about how to handle high gas prices several times over the last five years, and rather than write about it yet again, I thought I would point you in the direction of those posts. Guest Poster Jane Simpson writes about how the way you drive can have an impact on your fuel economy. Christina shares a handy calculator to help you decide whether or not to trade in your vehicle for a more fuel-efficient model. Michelle helps you deal with rising gas prices with a variety of ideas you may not have considered. Guest Blogger Susan has put a lot of miles on the road. Read how she makes her commute more affordable and enjoyable. When you live in a rural area like I do, public transit isn’t an option. Biking to town isn’t really an option either. Nor is living with just one vehicle. But there are some simple things you can do (like making fewer trips and carpooling) that can help. Hopefully the posts I’ve shared here will inspire you in some new ways. How I long for $3.99!! Gas in CT is over $4.00; I saw $4.01 once last week, but it’s usually closer to $4.15. Makes me want to cry. Yikes! I really hope it doesn’t go too much higher.